I am so mad I could spit and bite! I've seen a lot of bad reporting and bad legal decisions during my time blogging, but never before have I seen the media conspire with the criminal justice system in such a calculated, prejudiced, stigmatising, and ultimately harmful way. A gay man from a small city in Michigan who has been harrassed and beaten up by neighbours for years, has been charged with "assault with intent to maim, assault with intent to commit great bodily harm and possession or use of a harmful device" after the latest assault resulted in biting his neighbour the lip whilst he was defending himself. The story first appeared on October 30th in the Detroit News. Although police allege [the accused] was the lone attacker -- biting neighbor Winfred Fernandis Jr., 28, on the lip following the Oct. 18 confrontation -- [the acccused] says he's long been the target of bigotry on his street, and Fernandis, along with several of Fernandis' family members, took turns beating him. "I have no memory of biting him," said [the accused], who is due in 41-B District Court for a preliminary hearing Monday. He divulged his HIV status after questioning from the media. "This person has been threatening me for years. The hatred needs to stop." "He divulged his HIV status after questioning from the media." How did that happen? Well, Fox News did some 'investigating' and discovered he was HIV-positive. They asked him to confirm it on camera - he did. They then told the bitten neighbour on camera. That's when it got ugly. Here's the Fox News report. 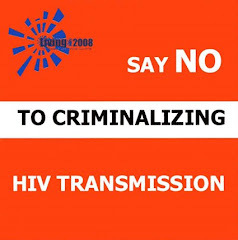 Since HIV is involved, Clinton Township District Court Judge Linda Davis said during a preliminary hearing on November 2nd that just knowing he was HIV-positive and biting the neighbour is enough to sustain these very serious charges, reports a second story in the Detroit News. "He knew he was HIV-positive, and he bit the guy," Davis said. "That on its own shows intent." No it doesn't, Judge Davis, because saliva from a bite does not expose someone to HIV. Now she is implicated, along with the police and the complainant (and his wife), in a hate crime. "I am still maintaining my client is the victim of a hate crime," [the man's attorney, James L. Galen Jr.] said. "He will be exonerated. This is the very first battle in what I think is going to be a long war." A pretrial and arraignment will take place on November 16th.